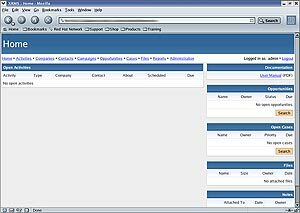 XRMS is a web-based application for managing business entities such as employees, customers, contacts, activities with those contacts, etc. XRMS generally falls into the category of application known as Customer Relationship Management (CRM), Sales Force Automation (SFA), with aspects of Business Intelligence (BI). Basically, if your company needs to manage relationships with your customers and business partners, XRMS should be able to fulfill your needs. We believe that XRMS is the most advanced open source CRM application written in PHP. We hope that you will find it useful.